Each ridge has a double increase at the centre. You may want to experiment with various decreases to find which you like best. If you are familiar with any method of temporary cast on, you might want to use it whenever you are not picking up from existing stitches. Where the instructions say cast on you can use a temporary cast on and remove it later. 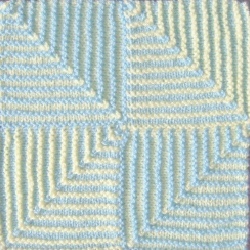 A mitred square begins with the number of stitches you need for two sides of the square. Each ridge of knitting is shorter than the one before so the ridges turn inwards to form an L-shape and eventually disappear away to a point to complete the square. 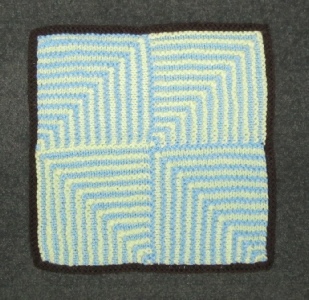 The squares could be made in several orders to create this block of four. The instructions are for the squares as they are numbered here. The blue lines denote cast-on edges. The red lines show edges where stitches are picked up. Using Light, cast on 47 stitches. Count this as the first row of the first ridge. Continue in this way until only one stitch remains. Cut yarns and fasten off. 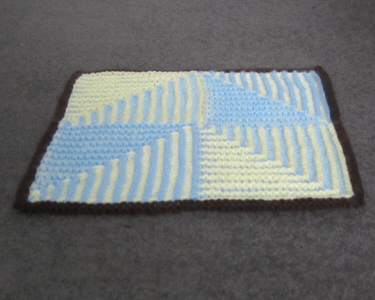 You should now be able to see 23 ridges of knitting. Work as for Square 1. The first row of every ridge is knit. The following instructions only tell you what to do on the second (wrong side) row of the ridge. 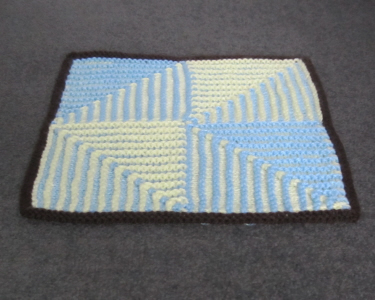 Mitred squares cannot be charted in the same way as other designs because you do not knit normal straight rows.